To access the customization tab of Halo 5: Guardians, press the Menu button, positioned just above the right analog stick. 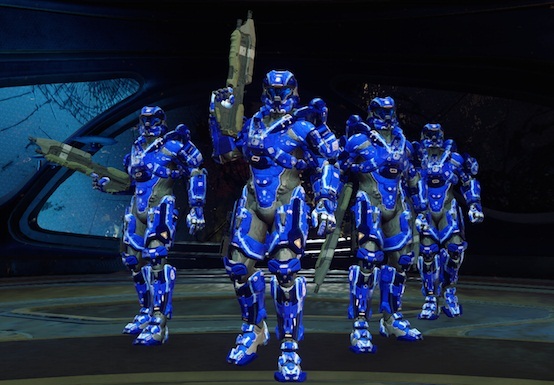 After that, a menu appears on the screen with the "Personalization" option, which allows the player to edit the look of Spartan before or after an online confrontation. The look of the fighter can be modified in the "Appearance of Spartan" area. In this option, the user is able to select the best armor and coolest helmets, as well as change the display and the primary and secondary colors and equipment. You can equip items by pressing the "A" button on the desired accessory. It is worth noting that new gadgets are unlocked according to the letters of the REQ system. It aims to equip a more stylish armor? Then play multiplayer matches, gain points REQ and open new packages to try to get better equipment. Remember that the items available in the Request packs are randomly generated, meaning you'll only rely on luck to get more powerful weapons. The Spartan ID can also be modified on the "Customization", as well as the visual emblem and special movements of the hero. In total, over 220 unlockable badges to represent it in multiplayer. The colors can be customized in "Badge of Color", a fairly complete dithering system. In addition to the badges, new attitudes and finishing moves can be chosen by the player. There are 18 killer movements in total, representing the completion of Spartan animations, and 14 types of posture, that define the heroic pose agent. The service tag, which is nothing more than an identification code of four alphanumeric characters, can be exchanged in "Service Tag". With the combination of four letters and numbers, it can be recognized easily during matches. Not only armor and helmets that can dramatically transform the look of your Spartan. In "Gun Case" tab, located in the "Personalization" option, you can modify the look of assault rifles and battle, DMRs, submachine guns and Magnum. Cosmetic accessories, namely, the only paintings of weapons are unlocked in Request packs. This means that apply stylish color to your weapons will only depend on your level of luck.